government are trying so hard to bury this, to drag it out until anger and activity dissipate. The event itself was probably incompetence driven but the follow up has entirely been stage managed to minimise impact on the government. I bet Theresa is just upset that she didn't manage to get the oiks dispersed across the country so as to stop them causing trouble. She even placed photographs of the heads of the relevant departments on the chairs halfway through her timeslot, and named and shamed the people that she felt should've turned up. The Housing Minister then changed his mind for the second time and put in an appearance. A short Twitter thread by a solicitor, correcting Lidington's remarks to media on Grenfell tenants' access to legal aid. PS It is Paragraph 35 Part 1, Schedule 1 of LASPO if you want to check. PPS I hadn't realised you had also said there was no record of a legal aid app by the Grenfell tenants. That is because there couldn't be! Seriously, completely impossible for what they were trying to do. So, that is a bit of an unwarranted smear the MoJ/LAA has fed you. Vox popped residents seem clued up over the media's MO they were glad the TV cameras came but know the circus soon leaves town when it involves working class people. Only one journalist from a newspaper had been spotted. Nick Paget-Brown leader of Kensington and Chelsea Council has resigned. Kensington and Chelsea Council leader Nick Paget-Brown has resigned following continued criticism of the council's handling of the Grenfell Tower tragedy. Mr Paget-Brown faced calls to resign from London Mayor Sadiq Khan and a number of other senior politicians. It comes a day after an aborted meeting of the council's cabinet in which leaders had tried to ban members of the public. That decision led to a rebuke from Downing Street on Friday. A Number 10 spokesman said: "The High Court ruled that the meeting should be open and we would have expected the council to respect that." Council leaders claimed an open meeting would "prejudice" the forthcoming public inquiry. She's very close to the fire and I don't doubt there are survivors who see it like this at the moment, but I think this is a bad road to go down. I'm not sure at what point the retired judge who wanted to broaden the scope of the enquiry suddenly became the non-empathising tehnocrat that everybody is grumbling about. Jez is doing it absolutely right. Fair play. I think that's Prime Ministerial, to use an overused term. Jeremy Corbyn is not backing the shadow fire services minister’s call (see 1.43pm) for Sir Martin Moore-Bick to resign as chair of the Grenfell Tower inquiry, according to a party source. The Labour leader “has not called for him to go”, a source said. Corbyn has demanded a two-part inquiry looking first at the specific issues at Grenfell and then a wider examination of national issues. And he also wants transparency and the full involvement of the residents in the process, a source said. 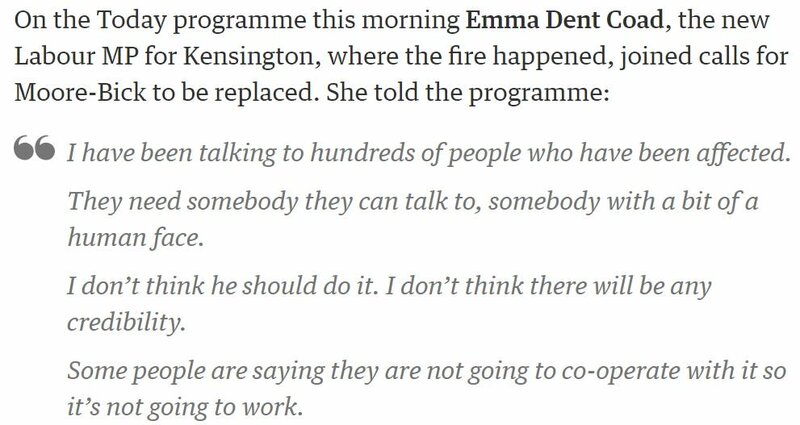 Harsh though I've been on Emma Dent Coed there, it has been important that there's an MP very much on the survivors side. I didn't have great confidence in Victoria Borthwick to do that. Bones McCoy wrote: I'm not sure at what point the retired judge who wanted to broaden the scope of the enquiry suddenly became the non-empathising tehnocrat that everybody is grumbling about. Doesn't the counsel for the families (and their team) do most of the talking to the survivors anyway? If you look at his record, it does seem that there have been one or two cases where he has tended to come down, when he has made his judgements, on the side of the establishment and he has been overturned in the supreme court on that basis. Says heavyweight legal commentator, Chris Williamson. He's seen something on Twitter, and he knows what he thinks, and has had enough of experts. Surprised he doesn't call the judge "Blairite". David Liddington has put out a statement defending the judge against attacks from MPs. Good man. Wasn't there just the one case which, far from being overturned for coming down on the side of "the establishment", was reversed on a point of law? On the one hand, I can certainly see why trust is thin on the ground amongst the residents who were let down before, during and after the blaze. On the other, we cannot let baseless or exaggerated concerns stir the pot any further. That serves nobody. Least of all, those who have lost so much. Yeah, exactly. The left, least of all, needs to be avoiding this stuff about "out of touch legal establishment" and the paranoid cover up stuff it feeds into. I give Emma Dent Coed a bit of leeway, as being the MP for survivors, but even so, she's out of order. Williamson though can shut his gob. He shouldn't be treading on another shadow's toes either. Even if it is Burgon. Tubby Isaacs wrote: Yeah, exactly. The left, least of all, needs to be avoiding this stuff about "out of touch legal establishment" and the paranoid cover up stuff it feeds into. I'm surprised you haven't mentioned David Lammy and his attacks on the judge.